As new data protection laws change the way you obtain and demonstrate consent, a large amount of your database will lack the adequate opt-in permissions for marketing. Speak to our team today, and we can start preparing your free GDPR revenue impact analysis. Don't leave it to chance. Register your interest today to see how GDPR will effect your business. "The average B2B marketing database contains between 50% and 80% of prospects and customers that have never expressly opted-in or opted-out to your marketing." 60-80% of an organisation’s revenue comes from 18-30% of their customers. Whose permission do you think is most important to verify? 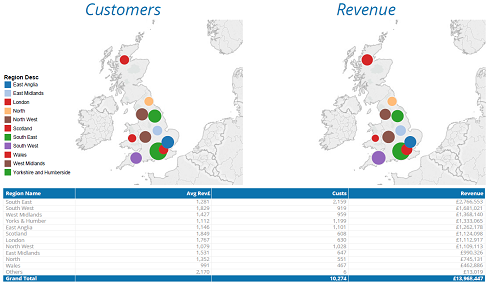 We use a unique modelling process called Money Mapping to analyse your customer and prospect database. 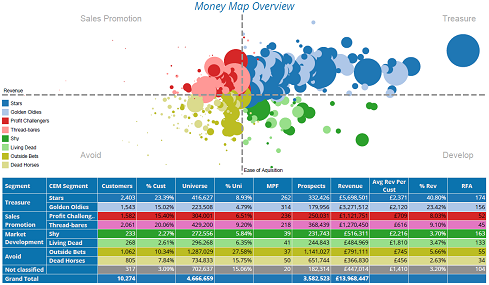 Money Mapping shows you how much revenue each record is potentially worth, segmenting your customers based on their growth, revenue and market penetration. This will allow you to reveal the 18-30% of your customers and prospects who bring the most value to your business and will be CRITICAL to secure verified consent from with an appropriate repermission strategy. We’ll help you retain essential customers and prospects who have a huge impact on your revenues. What’s in a GDPR Revenue Impact Report? Don’t fall into the trap of blasting your database with annoying ‘Would you like to continue receiving our marketing?’ emails. Let’s get started for free, with results in less than a week. To start with, we can provide a one-page topline analysis, highlighting the opt-in statuses within your database and the critical customers and prospects where action is needed now to gather permissions. We'll highlight revenue opportunities, customers and prospects you're in danger of losing and which customers, quite frankly, are not worth worrying about. All this through our Money Mapping modelling algorithm, which has been built and refined over 25 years. Find out who to repermission, how to repermission and where to focus on maintaining your most valuable prospects and customers.